﻿ The Ann Arbor Chronicle | CTN: What’s The Vision for Local Television? CTN: What’s The Vision for Local Television? Editor’s note: In April 2011, The Chronicle sought to verify statements about Ann Arbor Downtown Development Authority finances made by city staff at the Ann Arbor city council’s Feb. 17, 2009 meeting. We learned that the recording of the meeting was no longer available from Community Television Network (CTN), which is part of the city of Ann Arbor’s communications unit. The DVD of the meeting was missing and the online content had been deleted. Chronicle file photo from September 2010 of the control room adjoining the CTN television studio, located on South Industrial Highway. On the screens are images from a local League of Women Voters city council candidate forum. The Chronicle subsequently obtained an audio cassette recording of the Feb. 17 meeting made by the city clerk. In relevant part, we report the contents of that city council cassette tape in a separate article. For this article, we take a view of CTN as an organization that’s broader than a missing DVD. But we still begin with a city council meeting. In May 2009, former cable communications commissioner Paul Bancel addressed the city council during the time allotted for public commentary. He suggested that when councilmembers looked at the city budget, they’d see a $1.5 million allocation to community television. “It’s up to you to make it relevant,” he said. Is it relevant? For 38 years, Community Television Network has served Ann Arbor. “There will always be cable providers or video providers,” said CTN manager Ralph Salmeron in a recent Chronicle interview. But how does CTN fit within that media and communications landscape? In October 1973, Ann Arbor began broadcasting community television. After fighting for the creation of “public access television,” a group of local activists began running one public access channel – Channel 6. It would not be called “community television” until years later. They initially set up shop at 403 S. Fifth Ave., but by 1974 had moved to the Old Union Hall, located at 208 W. Liberty. The operation was known as Ann Arbor Public Access. In February 1978, five years after public access television began broadcasting, the city of Ann Arbor took over the control of Ann Arbor Public Access. 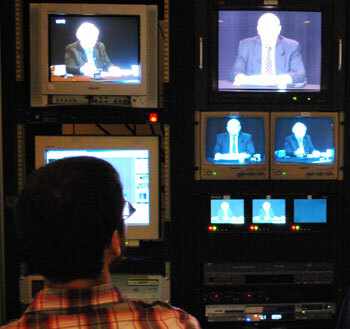 The city’s relationship with public access television, and the monetary support that followed through franchise fees, was not finalized until the start of 1980. By then, the name had been formally changed to the Community Television Network (CTN). By the time current manager of CTN Ralph Salmeron took that position with the organization in 1989, CTN had expanded to include three channels – one each devoted to public, educational, and municipal programing. CTN continued to receive federal funding and franchise fees. The city council finds that the further development of cable communications may result in great benefits for the people of the city. Cable technology is rapidly changing, and cable plays an essential role as part of the city’s basic infrastructure. Cable television systems permanently occupy and extensively make use of scarce and valuable public rights-of-way, in a manner different from the way in which the general public uses them. The city council finds that public convenience, safety, and general welfare can best be served by establishing regulatory powers vested in the city to protect the public and to ensure that any franchise granted is operated in the public interest. (1) “Access channel” means any channel on a cable system set aside by a grantee for public, educational, or governmental (“PEG”) use. The public access channel, A2TV, gets roughly one-quarter of CTN’s resources, Salmeron estimates – there’s a roughly even distribution across the four channels. Compared to the 75% of resources devoted to public access in the early days, it’s clear that CTN’s priorities have evolved in the last 30 years. In reflecting on the value of CTN to Ann Arbor, one way to frame the question is in terms of dollars and cents. How much does Ann Arbor invest in CTN? The short answer this year is about $1.8 million – it’s increased in the two years since Paul Bancel addressed the city council. Where does that $1.8 million come from? Cable franchise fees constitute CTN’s only significant source of funding. Cable operators (in Ann Arbor, it’s Comcast) pay to the city 5% of their yearly gross revenue from operations within Ann Arbor. And by city ordinance, the franchise fee goes directly into funding the activities for which CTN is responsible. (7) The franchise fee revenues received by the city shall be directed to the cost of franchise administration, operation of PEG access television, and communications and media operations of the City. That has more or less insulated CTN from discussion during the city council’s yearly budget talks, even during budget retreats in recent years when councilmembers have been encouraged by city staff to put everything on the table. CTN’s funding will be stable unless cable franchise fees were to be eliminated by the state legislature, or the city ordinance were changed to direct franchise fee revenues in some other way. The CTN budget funds the city communications manager, half the salary of the city’s communications unit manager, the CTN manager, two CTN assistant managers, three producers, two programmers and two training/facility coordinators for a total of 11.5 positions. Given the technology- and hardware-based nature of operating a cable television network, equipment costs might be expected to be a large part of the budget. But compared to employee costs, equipment costs for CTN are not nearly as great. In two out of the last three years, CTN has spent around $100,000 on equipment – in the other year, equipment expenses dipped to around $40,000. But the 2012 budget includes $326,616 for equipment, with almost $200,000 projected for FY 2013. The increase is due to additional capital outlays required to convert equipment to digital format. The city of Ann Arbor leases space for the CTN offices on South Industrial Highway. It’s a 10-year lease, which began in 2008, with an annual cost of around $100,000. What kind of programming will $1.8 million support? The news magazine Salmeron means is For Your Information (FYI), which airs on CitiTV, Channel 19. This past February, CTN aired the 500th edition of the show. A recent edition of FYI included segments on a theatre production in West Park, Ypsilanti’s Heritage Festival, and breastfeeding awareness month. Other Channel 19 programs include Ward Talk (interviews with city council members) and Conversations (interviews by Jim Blow with public figures). Recent programs aired on CTN’s Channel 19 are available online. In seeking that local flavor on other channels, CTN fulfills two very separate functions. The first coincides with the network’s history as a public access center. Channel 17, the public access channel, provides a venue for citizens. As Salmeron notes, “[A]ny citizen can step up and comment … [L]iterally, our programs are a soap box to get themselves heard.” One example of that is the CTN-produced Access Soapbox on Channel 17, a program that allows Ann Arbor residents to get in front of a camera and say their piece by expressing an opinion, announcing events, or raising any issues they think should be of concern for other Ann Arbor residents. An example of a regular program airing on Channel 17 that is not produced by CTN staff is Other Perspectives, a public affairs interview show hosted by Ann Arbor resident Nancy Kaplan. While it receives just one-quarter of CTN’s resources, a commitment to public access remains an integral part of CTN’s mission. That’s reflected in part by a recent effort to create a kind of online clearinghouse for video material related to Ann Arbor with a CTN Miro Community. In addition to hosting Channel 17′s public access material online, the Miro Community provides a way for Ann Arborites to add videos they’ve already uploaded to other online platforms – like YouTube, Vimeo, Blip.TV or Google Video – to CTN’s clearinghouse. Searches of those platforms for videos described with the term “Ann Arbor” currently return more than 10,000 results. Salmeron notes the growth of CTN’s meeting coverage on Channel 16 – a channel that began by airing only eight or so monthly meetings has grown to cover regularly 15 or 16 monthly meetings, Salmeron says. That works out to upwards of 210-220 live meetings a year, he estimates. Over the last two years, the boards of the Ann Arbor Downtown Development Authority and the Ann Arbor Transportation Authority have begun videotaping their meetings and making the recordings available through CTN’s online video on demand service. Earlier this year, the board of the Ann Arbor District Library considered, but ultimately rejected a proposal to videotape its meetings. What if sometime in the future, a resident wants to review one of those government meetings that was previously broadcast live? And more generally, what is CTN’s future role in Ann Arbor? The Chronicle followed up with Paul Bancel, who had addressed the city council back in May 2009 challenging the council to make CTN relevant. Bancel is a former member of the cable communications commission. By way of background, the commission is an advisory board to CTN that Salmeron says “helps us work through policy issues and budgeting.” One of the key recommendations from a study of CTN, undertaken by then-University of Michigan student Matt Hampel, was to eliminate the commission in favor of an information technology advisory board. Bancel offered two recommendations concerning CTN’s changing role in the future. His first suggestion is to revise the city’s ordinance on cable franchise fees so that the franchise fee revenue would be directed to the city’s general fund. While acknowledging that cable franchise fees could be directed to purposes other than local cable programming, Salmeron argues that CTN’s mission includes fulfilling a community role that is noticeably absent in broadcast stations of major cities such as Detroit. A. Increase by 15 percent information distributed to internal and external audiences about Ann Arbor municipal news, innovative programs, awards and services from July 1, 2011 to June 30, 2012. B. Develop and assist in the implementation of new technology resources to engage citizens and employees and enhance understanding of city services and initiatives from July 1, 2011 to June 30, 2012. A. Track the number of information pieces distributed monthly and highlight up to three hot topics via the Communication Office Matrix (information pieces include print/online newsletter, news releases, events, public information meetings, Gov Delivery notifications, CTN programs, social media tools, website page updates/development) by June 30, 2012. B. Track status of technology resource project implementations each month. These new resources include integration of new media, such as Podcasts and live web streaming of city meetings to promote City information and CTN services, applications to monitor effectiveness of communication messages/vehicles (Google Analytics, GovDelivery subscribers and click throughs, A2C report, Survey Monkey, VOD views) by June 30, 2012. C1. Track the number of new training participants, clients, and PEG programs (detailed information to include specific training classes, participants, and clients) via the CTN monthly report as a result of new trainer position/programs by June 30, 2012. The 210-220 yearly government meetings aired live on CTN represent an archiving challenge, even in the digital age. CTN’s current online archiving policies encourages medium, but not long-term, preservation of government meeting material. City council meetings are archived online for two years, and all other meetings are stored for six months. CTN buys its server space for online streaming and video on-demand from Leightronix, a company based in Holt, Mich. CTN has two PEG Central accounts, a service offered by Leightronix, that costs $5,677 per year. Each account has 500 hours of storage, so CTN has 1,000 hours total of online storage available. If CTN wanted to increase its storage capacity, it could do so in 500 hour increments by adding additional PEG Central accounts. CTN is still working on its archiving system. Only in 2009 did CTN start to convert its videotapes to DVD and begin to capture meetings on DVD. When The Chronicle was interested in reviewing the Feb. 17, 2009 Ann Arbor city council meeting, we first noted that the previously available online recording was no longer accessible – it had been a casualty of storage space limits. When we followed up with a request for the corresponding DVD, CTN staff reported that the disk was not in the slot in the binder where it was kept. However, the official written minutes made by the city clerk are “action minutes,” which record the outcome of all votes, but do not depict discussion among councilmembers, even in summary form. And the audio recordings made by the clerk’s office on cassette tape are not freely accessible to the public. No other organization besides CTN systematically makes visual recordings of government meetings. So CTN’s video is in some sense irreplaceable if it goes missing. About the writer: Hayley Byrnes is an intern with The Ann Arbor Chronicle. The Chronicle could not survive without regular voluntary subscriptions to support our coverage of local government and civic affairs. Click this link for details: Subscribe to The Chronicle. And if you’re already supporting us, please encourage your friends, neighbors and colleagues to help support The Chronicle, too! I’m confused. Does the table above mean that only 9 people watched the Planning Commission meeting when it was originally broadcast? Or through its on-line video demand service? Or both? Or something else? Re:  The table reflects that for May there were 9 views of planning commission meetings through the online video on demand service – that does not include viewership through ordinary television sets. Re. long-term online storage, I think it is worth noting that the Ann Arbor District Library already has infrastructure for long-term video hosting as well as a local history mandate. There’s no reason why CTN couldn’t negotiate a sharing agreement with the Library. I would really like to see CTN videos online in a more user friendly format. I think it could really increase public participation in local politics if it were easy to embed city council meetings on other websites and blogs. I realize there are issues with using a service like YouTube for hosting, but it’s worth noting that YouTube provides a free video hosting and allows people to post videos on their own sites. So we have no way to measure viewer numbers for the over-the-cable broadcasts but can for online accesses? It’s amazing with this large of a budget, taken from a 5% tax on local cable bills, this effort can pay for a boatload of staff but there are not enough funds for letting me watch CTN on my ATT Uverse system. Why not? Why doesn’t the City make the audio tapes routinely available for some reasonable fee? This just reminds me that I have to get off my lazy booty and work on my once and future BEER SHOW :) CTN is awesome…the people who work there couldn’t be nicer. You have an article dated August 11th 2011, about the relevancy of CTN base on a remark made over 2 years ago at a city council meeting in May of 2009. Sounds like sour grapes to me. You got the audio transcripts of the meeting you were looking for. Until CTN becomes the official holder for documents you have go thru city council for any past minutes of their meetings. By the luck of the draw it seems that you just pick an meeting that the video record was not available because of technical issues. Like I said, sounds like sour grapes. I’ve been very pleased by the videos now available on the city website from CTN footage. They are indexed by item and highly accessible. Since I don’t have cable (a beef with Comcast, not with CTN), I’m not able to watch Other Perspectives even in replay so will miss the Newshawks show tomorrow (Oct. 18, 7:00 p.m. Channel 17) and will have to wait till it gets to the (citizen-produced) website archive. We are really fortunate to have CTN and I’m grateful that so many governmental meetings are now covered.